For the first hurdles races in England around 1830, wooden barriers were placed along a stretch of 100 yards (91.44 m). The first standards were attempted in 1864 in Oxford and Cambridge: The length of the course was set to 120 yards (109.7 m) and over its course, runners were required to clear ten 3 foot 6 inch (1.07 m) high hurdles. The height and spacing of the hurdles have been related to Imperial units ever since. After the length of the course was rounded up to 110 metres in France in 1888, the standards were pretty much complete (except for Germany where 1 metre high hurdles were used until 1907). The massively constructed hurdles of the early days were first replaced in 1895 with somewhat lighter T-shaped hurdles that runners were able to knock over. However, until 1935 runners were disqualified if they knocked down more than three hurdles, and records were only recognized if the runner had left all hurdles standing. In 1935 the T-shaped hurdles were replaced by L-shaped ones that easily fall forward if bumped into and therefore reduce the risk of injury. However those hurdles are weighted so it is disadvantageous to hit them. The current running style where the first hurdle is taken on the run with the upper body lowered instead of being jumped over and with three steps each between the hurdles was first used by the 1900 Olympic champion, Alvin Kraenzlein. The 110 metre hurdles have been an Olympic discipline since 1896. Women ran it occasionally in the 1920s but it never became generally accepted. From 1926 on, women have only run the 80 metre hurdles which was increased to 100 metres starting in 1961 on a trial basis and in 1969 in official competition. In 1900 and 1904, the Olympics also included a 200-metre hurdles race, and the IAAF recognized world records for the 200 metre hurdles until 1960. Don Styron held the world record in the event for over 50 years until Andy Turner broke the record in a specially arranged race at the Manchester City Games in 2010. Styron still holds the world record in the 220 yard low hurdles. The sprint hurdles are a very rhythmic race because both men and women take 3 steps (meaning 4 foot strikes) between each hurdle, no matter whether running 110/100 metres outdoors, or the shorter distances indoors (55 or 60 metres). In addition, the distance from the starting line to the first hurdle - while shorter for women - is constant for both sexes whether indoors or outdoors, so sprint hurdlers do not need to change their stride pattern between indoor and outdoor seasons. One difference between indoor and outdoors is the shorter finishing distance from the last (5th) hurdle indoors, compared to longer distance from the last (10th) hurdle outdoors to the finish line. Top male hurdlers traditionally took 8 strides from the starting blocks to the first hurdle (indoors and outdoors). The 8-step start persisted from (at least) the 1950s to the end of the 20th century and included such World- and Olympic champions as Harrison Dillard, Rod Milburn, Greg Foster, Renaldo Nehemiah, Roger Kingdom, Allen Johnson, Mark Crear, Mark McCoy, and Colin Jackson. However, beginning in the 2000s, some hurdle coaches embraced a transition to a faster 7-step start, teaching the men to lengthen their first few strides out of the starting blocks. Cuban hurdler Dayron Robles set his 2008 world record of 12.87 using a 7-step start. Chinese star Liu Xiang won the 2004 Olympics and broke the world record in 2006 utilizing an 8-step approach, but he switched to 7-steps by the 2011 outdoor season. After the 2010 outdoor season, American Jason Richardson trained to switch to a 7-step start and went on to win the 2011 World Championship. American Aries Merritt trained in Fall 2011 to switch from 8 to 7, and then had his greatest outdoor season in 2012 - running 8 races in under 13 seconds - capped by winning the London 2012 Olympics and then setting a world record of 12.80. Of the 10 men with the fastest 110m hurdle times in 2012, seven used 7-steps, including the top 4: Aries Merritt, Liu Xiang, Jason Richardson, and David Oliver. Hurdle technique experts believe the off-season training required to produce the power and speed necessary to reach the first hurdle in 7 steps, yields greater endurance over the last half of the race. That added endurance allows hurdlers to maintain their top speed to the finish, resulting in a faster time. Dayron Robles also ran 12.88 (2008), 12.91 (2008), 12.92 (2007), 12.93 (2008), 12.95 (2008), 12.96 (2008). David Oliver also ran 12.90 (2010), 12.93 (2010), 12.94 (2011), 12.95 (2008). 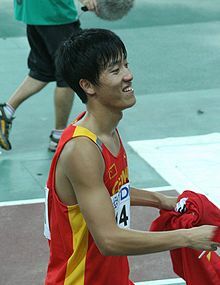 Liu Xiang also ran 12.91 (2004), 12.92 (2007), 12.93 (2006), 12.95 (2007). Aries Merritt also ran 12.92 (2012), 12.93 (2012), 12.94 (2012), 12.95 (2012). Allen Johnson also ran 12.93 (1997), 12.95 (1996), 12.96 (2006). Sergey Shubenkov also ran 12.95 (2018). Omar McLeod also ran 12.96 (2017). ^ Source for switch from 8-step start to 7-step start amongst men is Track & Field News magazine, March 2013 (Vol. 66, no. 3), "Is the 8-Step Hurdle Approach Gone? ", by Jon Hendershott; pp. 7-8; interviews with Aires Merritt's coach Andreas Behm and Renaldo Nehemiah. ^ "All-time men's best 110m hurdles". alltime-athletics.com. 7 July 2017. Retrieved 9 July 2017. ^ Bob Ramsak (7 September 2012). "12.80!! Merritt stuns with World record in 110m Hurdles in Brussels - Samsung Diamond League - FINAL, Part 2". IAAF. Retrieved 11 September 2012. ^ Kayon Raynor (24 June 2017). "Athletics: Olympic champion McLeod sets sizzling 110m hurdles pace". Reuters. Retrieved 25 June 2017. ^ Bob Ramsak (3 July 2018). "Shubenkov scorches to 12.92 world lead at Gyulai Memorial". IAAF. Retrieved 5 July 2018. ^ "IAAF Diamond League". IAAF. Archived from the original on 19 July 2010. Retrieved 19 July 2014. ^ "110m Hurdles Results" (PDF). static.sportresult.com. 4 July 2015. Retrieved 5 July 2015. ^ Mike Rowbottom (18 July 2014). "Kiplagat shows his class with 3:27.64 in Monaco - IAAF Diamond League". IAAF. Retrieved 19 July 2014. 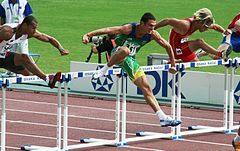 Wikimedia Commons has media related to 110 m hurdles. This page was last edited on 16 April 2019, at 14:16 (UTC).